A spiritual journey and reflective experience of what that first Easter Sunday must have been like. Imagine scene after scene of people encountering the Risen Christ. What the Gospels leave to imagination and faith one now can prayerfully imagine what those experiences may have been like. A spiritual journey and reflective experience of what that first Easter Sunday must have been like. Imagine scene after scene of people meeting the Risen Christ. What the Gospels leave to imagination and faith one now can prayerfully imagine and experience what those encounters may have been like. The opening chapter and each succeeding chapter offer us an opportunity to experience the joyand faith expressions of the first followers of Christ. Have you ever wondered if Christ visited His mother after His Resurrection? This book brings you through such an encounter that is not just an intimate look into a remarkable meeting of Mother and Son but you are given a visual and sensory experience as well as you are invited to recall the fragrant aromatic ointment that Mary of Bethany poured over the feet of Christ prior to His death on the Cross. Present in each chapter will be the ever-present refrain during these encounters, “Be Not Afraid”. Each chapter offers us an encompassing portrait of the people and places that we have come to know from the Resurrection stories found in the Gospels. 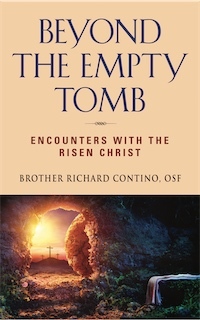 However, these chapters with prayerful literary license allow us to imagine and reflect through a Lectio and Visio Divina of reading and of seeing the remarkable transformation of the lives of people forever changed with each encounter that is Beyond the Empty Tomb! As I read his book I stopped circling the times he uses the words fragrance, scent, aromatic, smell, linger, pervading, aroma, fragrant. These words weave paragraphs and chapters into the emblematic shroud left behind in the empty tomb as testimony of our God’s faithful promise that love is stronger than death and we need not be afraid. Reflective portrayal of Gospel accounts of the birth of Christ. Brother Richard Contino is a member of the Franciscan Brothers of Brooklyn. As a religious educator, he has taught on the high school level in New York and North Carolina. Brother's previous books are These Sacred Days and On the Way to Bethlehem.